Severson: Who do you trust? Not sure who to vote for? Ask yourself this…Who do you trust more? A lawyer who seems to think that elections are a child’s game? Or a man who gave 22 years defending your right to vote? Let’s be blunt. Steve Simon doesn’t have an agenda of his own. He’s a lackluster candidate at best. Now that he’s in trouble, isn’t it interesting that Steve Simon has resorted to race-baiting? By comparison, Dan Severson has run a positive, substantive campaign. He’s offered new ideas. He’s highlighted his years of service to our nation. Having known Dan for almost a decade, I know that he’s a natural-born hero. Dan’s 22 years of service verify that. When Dan proposed a system to make voting easier for Minnesotans serving overseas in the military, the closest thing to substantive criticism DFL Party Chairman Ken Martin’s could come was that Severson had sponsored lots of veterans legislation while in the legislature. Minnesota’s Secretary of State needs to be a man with integrity. Anyone that’s willing to intentionally play the race-baiting card to attract votes isn’t a man of integrity. That’s the definition of a politician who didn’t hesitate in frighten voters with the worst political imagery imaginable. Dan Severson is a leader and a man of integrity. That’s what I’m looking for. This article highlights another set of problems for MNsure. It doesn’t take a great prognosticator to predict that MNsure will be a disaster when open enrollment starts. Minnesota Association of Health Underwriters Board Chair Alycia Riedl says health insurance brokers who work with MNsure are nervous. Riedl says there is no computerized renewal system in place, and if it is not functional by the next MNsure open enrollment, Nov. 15, it could affect tens of thousands of people who are already enrolled through MNsure. Riedl says it will severely limit their access to information if they want to change their policies in any way and could create lengthy delays for MNsure consumers. “The renewals would literally have to be done by hand, and that will take a long time, creating a backlog that hurts consumers who want to make better choices, and it will hurt MNsure’s bottom line if it isn’t taken care of soon,” Riedl said. Considering the incompetence and corruption of the MNsure Board of Directors, Gov. Dayton’s head-in-the-sand routine during debates and the DFL’s insistence that everything’s fine, it isn’t surprising that MNsure isn’t working. That’s just part of the lengthy list of failures I’ve written about. I don’t want to gloss over it, though, as just another item on a checklist. It’s much more than that. Not having a “computerized renewal system in place” means everything renewal-related is done manually. If open enrollment started at the beginning of October, Minnesotans would be irate with Gov. Dayton to the point that they’d throw him out of office next Tuesday. Whether it’s called incompetence or whether it’s called something else, the inescapable truth is that Gov. Dayton a) created MNsure, b) improperly implemented MNsure, c) ignored MNsure’s mismanagement then d) lied about MNsure to get re-elected. Personally, I’d call it an unmitigated disaster. I’m not alone with that opinion. Alida Messinger’s post-election agenda: kill PolyMet? There’s all sorts of buzz around St. Paul of post-election plans by radical environmentalists to launch an offensive to kill copper-nickel mining in Minnesota. That’s been the stated goal of environmental organizations like the Minnesota Environmental Partnership, Friends of the Boundary Waters, Conservation Minnesota and MCEA. It’s verified fact that Alida Rockefeller, one of the DFL’s biggest contributors and Gov. Dayton’s ex-wife, is responsible for much of the money that goes into these anti-mining organizations while supporting Gov. Dayton’s political activities. Sources close to organized labor active in northeastern Minnesota say that Ms. Messinger and her allies are now prepared to fund a PR campaign to kill PolyMet. That’s certain to get these miners’ attention. Alida Messinger’s post-election agenda won’t sit well with union workers who would work on the construction of the mine or the union workers who would fill the mining positions once the plant opens. As a result, at least some of the rank-and-file might stop supporting the DFL. Rumor has it that a prominent, talented DFL strategist is already lined up for this aggressive campaign. This strategist allegedly has been approached by Big Labor. This strategist has allegedly been quite coy about what’s coming. The biggest question remaining is simple. What, if anything, does Gov. Dayton know about this anti-PolyMet PR offensive? Given his unwillingness to support mining projects like PolyMet even if they meet environmental standards, I think it’s a more than fair question to ask. I still think that Jeff Johnson will win this race. If Gov. Dayton is re-elected, though, will Iron Rangers trust Gov. Dayton to not be swayed by a massive anti-mining ad campaign? Will blue collar voters in northeastern Minnesota demand answers from Dayton before Tuesday? In Minnesota policies are renewed every year, so those consumers were being notified they would have to buy more comprehensive, and possibly more expensive, plans for 2014. Within a month President Obama announced people in that predicament could keep their old plans if they wanted to. There’s no way to know how many of those 140,000 became uninsured in 2014, kept their old plans, or bought better ones. And the truth, according to researchers at the University of Minnesota, is that the share of Minnesotans with health insurance went from 92 percent to 95 percent in the past year. About 140,000 Minnesotans are receiving letters that describe changes to their current health care insurance policies for 2014 due to the federal health law. And while the national controversy over individuals finding their coverage canceled because of the Affordable Care Act doesn’t technically apply in Minnesota, state law prevents insurers from issuing cancellation notices unless their entire product line is discontinued, potentially higher prices offer little consolation. Because the changes will drive up costs by mandating richer benefits, Minnesota consumers might well be experiencing the same frustrations as those subject to cancellations elsewhere. Politifact’s Lie of the Year in 2013 was President Obama’s repeated promises that people could keep their health plan if they liked their health plan. I’ll stipulate that the headline should’ve said that “140,000 lose insurance that they liked.” There’s no question that 140,000 Minnesota families lost the insurance that they liked, though. The share of Minnesotans with health insurance went from 92 percent to 95 percent in the past year. In 2012, before MNsure’s rollout, 93% of people had health insurance. Of those people that didn’t have health insurance, 60% of them were eligible for taxpayer-subsidized health care. Had the Dayton administration run a $5,000,000 multimedia advertising campaign telling people how they could’ve enrolled in those programs, more than 97% of Minnesotans would’ve been insured…in 2012. Here’s another verified fact that Croman missed in his ‘fact-check’: a higher percentage of Minnesotans could’ve been insured without spending $160,000,000 on a website that doesn’t work. The Obama Effect in action? Republican gubernatorial candidate Larry Hogan has a 5-point lead over Democrat Anthony Brown in a surprisingly close race in Maryland, according to a poll conducted on behalf of the Hogan campaign and obtained by THE WEEKLY STANDARD. The survey of more than 500 likely Maryland voters finds Hogan with 44 percent support, while Brown, the lieutenant governor, has 39 percent support. Fourteen percent say they remain undecided. That’s a 17-point swing from the campaign’s internal poll in July, when Brown led Hogan by 12 points, 48 percent to 36 percent. The poll also found Hogan winning self-identified moderate voters by 6 percentage points and independent voters by 27 percentage points. The Republican also has a higher favorability rating (49 percent) than the Democrat (41 percent). I’m automatically suspicious of private polling done on a candidate’s behalf. I won’t dismiss this because it fits with other polls’ trends. It’s difficult to determine how much Zach Dorholt’s dismal debate performance last night will affect his race against Jim Knoblach. Still, for people watching the debate either on TV or from the City Council Chambers got proof that Zach Dorholt is an empty suit. The gravitas gap between Dorholt and St. Cloud businessman Jim Knoblach was frequently on display. Through demand. Demands build toothpaste. Companies don’t build toothpaste. That’s absurd thinking. Did demand create laptop computers, iPhones or MP3’s? Did the stimulus create a growing economy? That was the foundation of President Obama’s stimulus bill. GDP didn’t start picking up, if you can call it that, until after the Federal Reserve started pumping $1,000,000,000,000 a year into the economy through quantitative easing. Even then, economic growth has been anemic, the worst recovery since WWII. Earlier in the debate, Dorholt talked about how Minnesota had to “invest more money” to match skilled workers with the needs of Minnesota’s businesses. Later, Dorholt reversed himself, saying that, under DFL control, the Higher Ed committees “did a good job” in matching businesses with the skilled workers that they needed. It’s impossible to do both. Saying that Dorholt isn’t an impressive speaker is understatement. Saying that he’s a better orator than he is a policy wonk is accurate. The best thing I can say is that he’s a typical politician. That isn’t the type of trifecta I’m hoping for. Jim Knoblach was clearly the most informed candidate in that matchup. Wednesday night, the League of Women Voters’ St. Cloud Chapter hosted a candidate forum at the St. Cloud City Council Chambers. While a number of topics were discussed, this post will focus on the empty answers of Dan Wolgamott, the DFL-endorsed candidate running against Tama Theis. First, it’s important to mention that all of the questions were from the audience. Now that that’s addressed, let’s get to one of the patterns that emerged from Wolgamott. A half hour into the debate, it became obvious that Wolgamott was pretending to be all things to all people. In responding to a person’s question, he’d thank them for the question before telling them that the issue was a priority for him that he felt personally attached to for one reason or another. Apparently, everything is a priority with Wolgamott. Apparently, Mr. Wolgamott hasn’t figured it out that, if everything’s a priority, nothing is a priority. Wolgamott said that it was a shame they didn’t build Northstar all the way to St. Cloud. He declared that he’d vote to raise taxes to fund “a comprehensive transportation system.” He’s for more money for St. Cloud schools. In short, Wolgamott’s agenda could be described as the ‘No-DFL-Special-Interest-Group-Left-Behind’ agenda. Tama Theis’s response to Wolgamott’s criticism about not voting for the K-12 bill was that the bill stripped out the student accountability requirements and that it stripped out the basic skills test for teachers. Theis continued, saying that she serves on the House Higher Ed Committee. She said that one of the things they struggle with on that committee is the fact that many students are accepted into college that aren’t prepared for college. She then said that the goal shouldn’t be to graduate more students from high school but to prepare them for college. That answer shut down Mr. Wolgamott’s trip through Wonderland in a hurry. NEF Numbers—Is President Potter ‘Out of the Loop’ or Does He Just Make It Up? 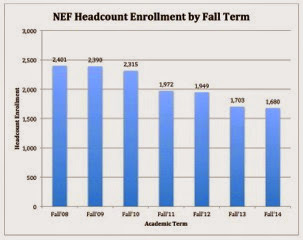 Clearly, the number of NEF for Fall’14 (1,680) is less than the number of NEF for Fall’13 (1,703). The number is only 23 students fewer, which corresponds to a decrease of 1.2% but it certainly is not up! So either President Potter is misinformed or confused about the number of NEF attending SCSU this Fall or he just said what he hoped was true. Whatever the actual explanation for the Potter misstatement, it is troubling that the President did not have a clear picture regarding a most important enrollment metric. Classes began at SCSU on August 25th, the article was published on August 29th and the 10th day enrollment numbers came out on September 9th. Did the numbers of NEF somehow change? Not likely. While the total enrollment numbers change from the first-day, to the 10th day, to the 30th day, to the final enrollment, the number of NEF may only change by one or two students. The NEF from the 30th day, which was released on October 9, 2014, is up from 1,680 to 1,683 for a whopping increase of three! However, let’s assume that the number of NEF for Fall’14 was up from Fall’13. If SCSU had 21 more NEF and its number of NEF was 1,704 for Fall’14, this would still be a drop of 697 NEF since Fall’08 corresponding to a drop of 29.0%! Using the actual decline of 718 NEF, the percentage drop is 29.9%. Is there a university within MnSCU that has had even half of the drop in NEF as SCSU? The answer is no. From F’08 to F’14, Mankato’s NEF numbers are down 7.1%. From F’08 to F’14, Winona’s NEF numbers are down 12.2%. SCSU stands alone as the clear leader in this department. As to the second part of the “Times” quote, until October 16, 2014 when the Third HuskyData Newsletter was published, no contemporary data has been shared by the administration about the NEF retention rate from Fall’13 to Fall’14 or for prior years for that matter. So, it turns out that President Potter was actually correct in saying that the NEF retention rate is up (70.5% for Fall’12 to 72.8% for Fall’13). However, with a decline of 718 NEF, which includes the reduction of the number of students who did not meet SCSU’s admission standards (DGS now ACE), one would expect that NEF retention rates would be up and up quite a lot simply based on the academic success profile of the incoming class. Additionally, the increase in the number of NEF due to the increase in the retention rate amounts to an increase of 39 students. Since headcount enrollment is down 5.1% from Fall’13, as reported in the Husky Data 30th Day Special Edition, this amounts to a loss of 776 students. As a result, an increase of 39 students hardly makes a dent in the loss of 776 students. So, President Potter was correct is saying that the NEF retention rate is up from the prior year. However, getting excited about an increase of 39 students when the overall headcount for Fall semester is down 776 students might be unwarranted. Until October 16, 2014, NEF retention rates had not been disclosed for a number of years, so at least making them public now is a small step in the right direction. A skeptic with a cynical perspective might have speculated that the reason not sharing the until now is the fact that despite dramatically reducing the numbers of high risk for dropping out students (DGS/ACE), the retention rate is up an embarrassingly small amount and considerably lower than in the past as well as considerably lower than rival Mankato. Additionally, the general retention rate for the largest group of SCSU students, those returning to study in years 3 to graduation has also not been reported for many years. Without the sharing of data, one is left to wonder and given the past history of the Potter administration’s data sharing, as documented by the Great Place to Work Survey data, it is simply more likely to be more of the same. Rep. Simon’s reciting the separate but equal line was an intentional race-baiting statement. It’s intent was to frighten African-Americans. That’s partisanship at its disgusting worst. Politicians that play on people’s fears aren’t public servants; they’re politicians. People that play hardball politics do it to win political fights. They aren’t particularly cunning. They just push hard to win. Politicians that play on people’s fears, fears that were created by decades of oppression prey on the vulnerable. Next, Rep. Simon was reading from his script the entire time. If he’s upset with Rep. Severson’s remarks, he shouldn’t need to bury his head in a script for 10 seconds. FYI- 10 seconds is long enough to say 45 words. It’s apparent that Rep. Simon’s hissy fit is 75% schtick meant to frighten minorities into voting, 25% Rep. Simon being a less-than-impressive candidate. A top tier candidate, at this late stage of the campaign, would rattle facts off without hesitation and with confidence that he knows his facts. Though it’s clear Rep. Simon isn’t a top tier candidate, that doesn’t mean Republicans shouldn’t work hard right through the last minute of Election Day. Candidates that get the most votes, whether they’re qualified or not qualified, still win. At this point in the campaign, the right attitude is to outwork the DFL every minute through the closing of the polls. Can SCSU Be Like The Universities In Utah or Pennsylvania? If you hang around SCSU for more than even a few minutes, you’ll probably hear something about the dramatic enrollment declines over the past five years (21.8% decline). Almost in the same breath, you’ll hear that the decline is due to demographics. People then nod and shake their head like this is a pronouncement from on high and it is often not challenged. However, many colleges and universities are not accepting the simple solution of demographics for their enrollment declines! 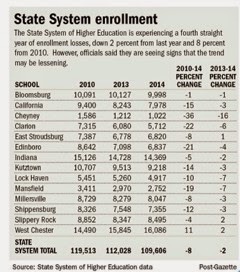 Two state systems, Utah and Pennsylvania, provide examples that document that enrollment decline is not preordained. Both states higher education system’s recent enrollment trends have significantly out performed SCSU’s and Utah bucked the national trend by actually increasing enrollment. “Utah is bucking the national trend of decreasing enrollments and overall our numbers continue to hold steady.” According to the US Census the nation saw a 5% decline in overall higher education enrollment over the three year time period from 2011-13. In the Utah higher education system, full-time equivalent students (FTE) increased from 106,680 in Fall’13 to 106,816 in Fall’14 for an increase of 136 FTE, which corresponds to an increase of 0.13%. This is at the same time that headcount enrollment declined from 167,594 in Fall’13 to 167,317 in Fall’14 for a drop of 277 students, which corresponds to a drop of 0.17%. Over the same three year time period, SCSU’s FYE enrollment dropped 17.3%, which is almost 3.5 times larger than the national overall decline in higher education enrollment. For Fall’13 to Fall’14, SCSU’s enrollment looks to be down a bit over 5%, which again is much larger than the national trend and the Utah system. Not all of the colleges and universities in the Utah system changed the same amount. Salt Lake Community College’s (SLCC) enrollment is actually down 5.1% from Fall’13 to Fall’14. The report continues to explain that for SLCC: “As a large part of their student body is enrolled part-time, we believe this decline (in headcount) is due to more people returning to full-time employment as the economy improves,” said Dave Buhler, Utah Commissioner of Higher Education. Removing SLCC from the numbers for the rest of the system, the University of Utah’s system grew 1.0% from Fall’13 to Fall’14. The enrollment of 27,000 high school students in concurrent enrollment courses are also not yet reported and will appear in “a more complete picture of fall enrollments” when final semester numbers are released. As a result, Utah’s final numbers will be even higher than those reported after three weeks of class. The data from Utah shows that the FTE enrollment is increasing while headcount enrollment is decreasing: “What that’s telling us is there are more students going full time,” Buhler said. More full-time students often translates into higher graduation rates, especially for those working toward a four-year degree, according Melanie Heath, spokeswoman for the Utah System of Higher Education. “Part of the rise is due to marketing. 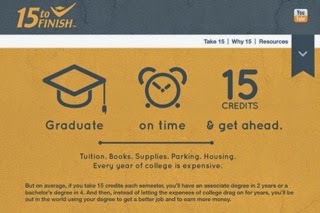 A program called ’15 to Finish’ urges students at all eight of Utah’s public colleges and universities to enroll full time.” Most bachelor’s degrees can be completed in four years when the student takes 15 credits each semester. Additionally, at USU students were charged as much as 60 percent more per credit for online classes than traditional on-campus classes and online credits weren’t included in the tuition plateau for regular courses. For this fall, USU lowered tuition for online classes to the same as that for regular classes and now includes online course in the tuition plateau. For SCSU, the FYE enrollment decline from FY10 through FY15 is going to be 21.8%, which is nearly three times larger than the decline experienced by the Pennsylvania State University System over the same period of time. Just as within MnSCU, the two largest schools have been headed in different directions in enrollment the last five years. West Chester has grown 11% while Indiana declined 5%. West Chester was the second largest university in the Pennsylvania State System just like Mankato was the second largest in MnSCU. Both have now moved to become the largest school in each of their systems. The Utah and Pennsylvania systems and individual schools within those systems that have bucked the national trend in declining enrollment offer lessons in how to increase or simply stem the decline in enrollment. SCSU can do many things to increase enrollment and might even learn some things from its in-state rival Mankato. “Banding tuition,” which is the Minnesota version of a “tuition plateau”, might help students enroll for more credits and graduate sooner. Minnesota State University–Mankato has banded tuition and that in itself might be reason enough for doing it. Banding tuition might not directly increase tuition revenue but graduating students earlier might be a way of having more ‘happy students,’ which is probably the best marketing tool a university could have. Simply banding tuition a few years ago might have even eliminated the need to spend nearly half a million dollars on a ‘rebranding’ campaign. The SCSU website currently lists tuition for regular undergraduate courses at $219.45 per credit. For online/guided study courses, tuition is listed at $312.40, which is 42.3% more expensive. Perhaps if SCSU wants to grow its full time equivalent enrollment, simply following what is happening at growing Pennsylvania and Utah schools might be warranted. Reducing the cost of online courses and banding tuition might increase retention and graduation rates and bring SCSU more in line with rival Mankato State. If nothing else, it might slow the rate at which Mankato is moving further ahead of SCSU. Demographics can be used as the solution for almost every type of enrollment decline. If you believe that fate is ‘written in the stars,’ you disregard all of the data that is contrary to your preconceived beliefs. Unfortunately, enough universities across the nation are growing that they are forcing the other colleges and universities within their state systems to rethink their answers. If the total number of students heading to college is decreasing, how are some colleges and universities increasing their numbers of students? The answer is quite simple: competition! Some schools have tried to focus on beating their competition. In a situation, where enrollment is static, it is an example of a ‘zero sum game’ in which some schools win at the expense of other schools (i.e., some schools lose). In a situation where enrollment is declining, the competition becomes even more cutthroat just to remain the same. The data shows that the competition for SCSU is not two miles up the road at St. Cloud Technical and Community College, it’s 113 miles almost due south at Minnesota State University—Mankato. Clearly, Mankato has been kicking SCSU’s ‘base’ the past five years and who knows, now that SCSU’s has fallen to number 2, SCSU’s new motto should be “We will try harder!” Maybe in the next rebranding campaign there will be some really cool buttons!